Rediff.com » News » BJP or Congress: Who will Deve Gowda choose? 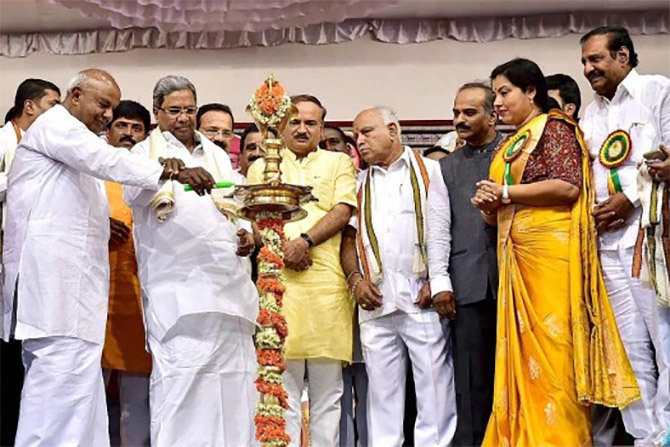 BJP or Congress: Who will Deve Gowda choose? With opinion polls predicting a hung assembly in Karnataka and the possibility that the JD-S could be the 'king maker' after the polls, H D Deve Gowda stays mum about his party's post-election strategy. If most opinion polls have predicted a hung Karnataka assembly with the Congress as the single-largest party, the Bharatiya Janata Party is hoping Prime Minister Narendra D Modi's blitzkrieg of public meetings could lead to a repeat of his Gujarat election campaign. In the Gujarat assembly polls in December, Modi had nearly single-handedly turned the tide in his party's favour. A BJP source on Tuesday said the PM would address 15 to 20 rallies in Karnataka from May 1. Uttar Pradesh Chief Minister Yogi Adityanath is slated to address over two dozen public meetings. The Congress, meanwhile, mounted a sustained attack on the BJP for giving party tickets to those facing corruption charges. It attacked the BJP for protecting mining baron G Janardhana Reddy and the BJP's chief ministerial candidate, B S Yeddyurappa. With opinion polls predicting that the Janata Dal-Secular could emerge the 'king maker', its chief, H D Deve Gowda, has kept everyone guessing about his party's post-election strategy. He blamed the BJP for allegedly running a corrupt and unstable government from 2008 to 2013, which saw three chief ministers being changed. He said the Congress' record on checking corruption was equally poor. Chief Minister Siddaramaiah filed his nomination papers from the Badami constituency. He will contest two seats, the other being the Chamundeshwari constituency. The Congress sought to exploit murmurs of discontent within the BJP by pointing out that Yeddyurappa is being ignored as his son was denied a party ticket. The BJP, to placate Yeddyurappa, appointed his son B Y Vijayendra as general secretary of the party's youth wing, the Bharatiya Janata Yuva Morcha. In a related development, the income tax department conducted searches on at least 11 contractors in Mysuru and Bengaluru, the Press Trust of India reported. These contractors are linked to public works jobs rendered by them on government tenders, officials said. The Election Commission said Rs 2,000 and 500 notes constitute 97 per cent of the Rs 41.3 million cash the tax sleuths have seized in Karnataka till now.